What does Commencement of Risk means? Should you buy Jeevan Tarun Policy or Not? 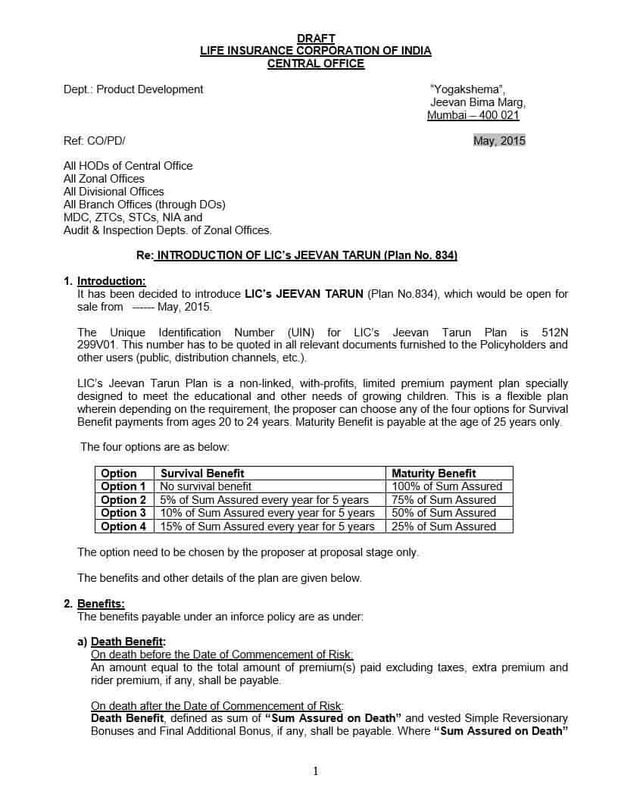 LIC is soon going to launch Child Money Back Plan with limited premium payment term under the name of ?Jeevan Tarun? (Plan no. 832). This plan aims to cater various financial needs such as for education, marriage etc. Couple of months back LIC had come out with similar plan for children (LIC New Children?s Money Back Plan (Table No. 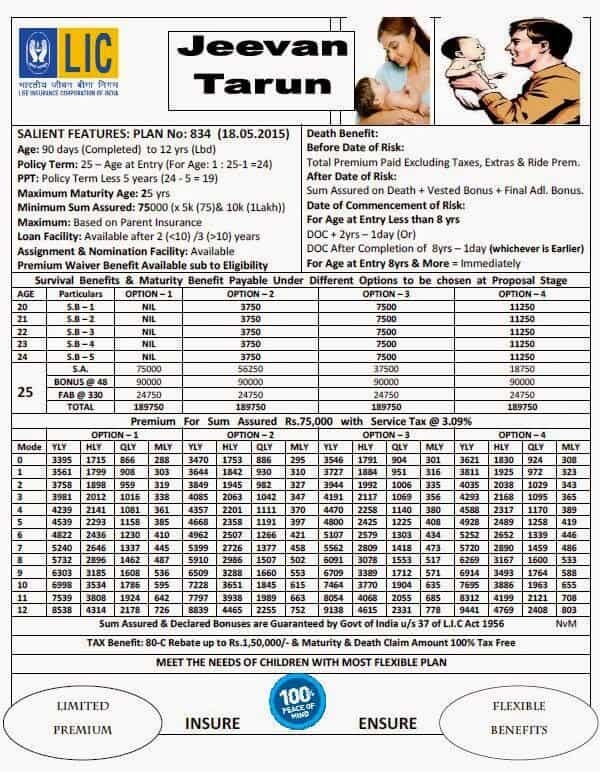 832)) but Jeevan Tarun (plan 834) has some additional options and rider over the previous plan 832. 1. Sum Assured (SA) shall be in multiples of Rs.5,000/- from SA Rs.75,000/- to Rs.1,00,000/- and Rs.10,000/- for SA above Rs.1,00,000/-. 2. Proposer can be either parent or legal guardian aging between 18 years to 55 years. 3. Premium Waiver Benefit Rider: An optional rider available by paying extra premium under which if the proposer of the plan dies, the premium becomes due after the death of the proposer shall be waived and plan will be continued up to the maturity term as if all the premiums are paid on time. 1. If death of the life assured (child) occurs before the commencement of risk, amount equals to all premiums paid (excluding taxes, extra premium and rider premium) will be paid. If the policy term is higher than 10 years, the minimum sum paid on the death of the life assured cannot be less than 105% of the total premiums paid. 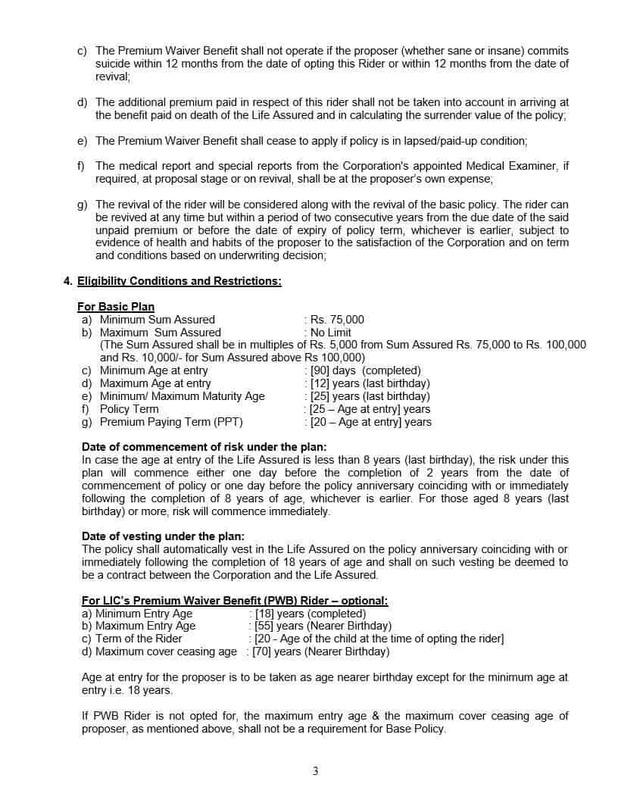 If the entry age of the life assured is below 8 years, then the risk will commence either one day before the completion of 2 years from the date commencement of policy or one day before the policy anniversary coinciding with or immediately following the completion of 8 years of age, whichever is earlier. For those aged 8 years or more, risk will commence immediately. Maturity & Survival benefits of the Jeevan Tarun policy is paid to the life assured (child) in the last 5 years of policy i.e. from 20 year to 24 year of age of the child. 1. First of all, Life Insurance is always taken for the bread winner of the house because the lives of the other family members are dependent on him/her. Since child cannot be the bread winner there is no need to even think about getting life insurance for your child. 2. Generally the higher education in India starts by the age of 18 years onwards and this plan offers maturity or survival benefits from the age of 20 years of child, which makes this plan not suitable for higher education. 3. These types of money back plans attracts investor by using words such as financial help for child marriage, education etc. but as we all know these money back plans usually?gives returns around 5% to 6% (maximum 7%) which even could not beat the inflation and in case of education, the rate of inflation is much higher than this rate.4. If still you are not convinced and would like to buy Jeevan Tarun policy than choose option first under the maturity & survival benefit. This is because in all other options insurer will retain certain percentage of amount with them and give you at a regular interval without adding interest. So it would be better to go with option one to take whole amount at once and invest in risk-free investment such as bank fixed deposits or NSC etc. Instead of buying money back plans for your child, do consider risk-free investment with higher returns of up to 9% for your child?s education, marriage etc. to secure his/her future. There is plethora of investment avenues to choose from namely PPF investment, Sukanya Samriddhi Yojana, Bank fixed deposits etc. In case your risk-appetite is higher, than you also can go for mutual funds or can invest directly into the equity (shares). How to save tax on Insurance plans? For the education of child, consider equity mutual fund that will help to create fund for the education of the child and opt for term plan insurance for the proposer. your suggestion is only applicable for the high income group..but for the middle income group it is very much suitable policy..PPF or FD won’t give waiver benefit if the proposer deceased before the PP TERM. 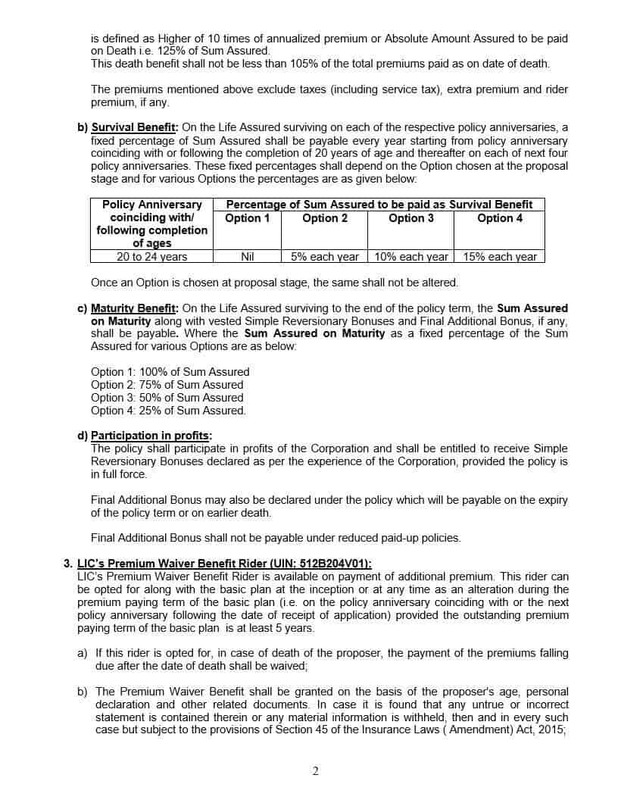 Premium Waiver Benefit Rider: An optional rider available by paying extra premium under which if the proposer of the plan dies, the premium becomes due after the death of the proposer shall be waived and plan will be continued up to the maturity term as if all the premiums are paid on time. I totally agree with you that there is no need of life insurance policy for the kid but please tell me how to secure their future like how to accumulate enough money for their higher education and marriage. I wish to know best education plans for child. Dear friends, Jeevan tarun is the best plan, it’s a plan which has risk coverage for both child and father, there is a premium waiver benefit in case of uncertainty, for the child career it’s better to have this plan rather than going to mutual funds share, term plan. To have a great returns it’s better to get this plan before the child attains 3 years of age. For more details you may email to chetan2605@gmail.com.